Best Garmin watch 2019: how do you find the right one for you? You've probably heard of Garmin, which is why you've come to this list. You might not know that for 30 years the brand has been making devices for the automotive, aviation and marine industries, but it's getting notable success in fitness. There are loads to choose from here, with most serious runners decked out in something from this brand, thanks to ease of use, decent prices and - most importantly - accurate and powerful tracking. Garmin also has one of the widest portfolios, from the budget Forerunner 10 to the expensive-but-powerful Fenix 5 Plus range, and its devices are among the best running watches you can buy right now. Garmin has also been finding success as a smartwatch maker too, and with stellar battery life and on-wrist notifications, some of those listed here are a genuine Apple Watch 4 alternative. We know it can be tricky working out which is right for you though, so here's our list of all the top Garmin watches out at the moment, and which ones offer the right specs for you - making sure you don't waste money on the wrong device for you or miss out on a better watch if only you'd spent a little more. Note: The following watches are ranked from cheapest to most expensive according to RRP at time of writing - prices may vary over time. You won’t find a cheaper heart rate tracking device in the Garmin range, so this is an option for those on a budget who want to use a heart rate strap to check their pulse while jogging. It’s perhaps fair to say that the Garmin Forerunner 15 is not the most aesthetically pleasing watch in the world (or even in the Garmin range), and it is often criticized for its flimsy build and basic screen, but then this is still a relatively affordable watch that you’re not buying for its looks. As with all Garmin watches, the Forerunner 15 enables the user to sync their data with Garmin Connect, opening up a whole other level of analysis and sharing. Coupled with the heart rate monitoring and activity tracking, this makes the Forerunner 15 a good value option for those looking for a slightly more advanced unit, without a hefty price tag. Despite being at a comparable price-point to the Forerunner 15, the Forerunner 25 takes things up a technical notch, courtesy of its Bluetooth and smartwatch capabilities. As a running watch, it boasts a very similar list of features and metrics to the less advanced watches above, but the addition of Bluetooth pairing makes the Forerunner 25 an appealing upgrade. The Forerunner 25 boasts a larger screen than the Forerunner 15, yet it is also more slimline and, frankly, a nicer-looking watch. While the running functionality is still relatively basic when looked at in the context of the entire Garmin range, you do get a reasonable selection of metrics (distance, pace, heart rate, calories), along with activity tracking. The key selling point of this watch, though, has to be the ability to instantly upload your data onto Garmin Connect via Bluetooth – a feature which elevates the Forerunner 25 above its similarly-priced family members, which need to be connected by USB. The new Garmin Forerunner 30 is a replacement - oddly - for the device that's above it in the list - the Forerunner 35 is actually older. This new model offers similar features - in fact, very similar indeed. The screen, weight, size and strap are all the same, and its main extra feature is that it offers cycling auto-detection. In our review of the Forerunner 30, we said it was "a pared-back run tracker that packs in some serious features" and gave it four stars out of five. If you can find it for the less money than the Forerunner 30 - the watch coming up next in this list - we'd recommend picking up the Forerunner 35 instead. Jumping up another price bracket now, and we’re faced with the Forerunner 35, a more fashion-conscious mid-range unit that's packing some powerful functions. The most obvious difference between the 35 and all of the watches detailed above (apart from its new sequel) is the introduction of Garmin’s Elevate technology, which enables heart rate monitoring at the wrist. This addition means you don’t have to go to the trouble of donning a chest strap before every run, and it also enables the unit to measure your heart rate throughout the day, building up a detailed profile. 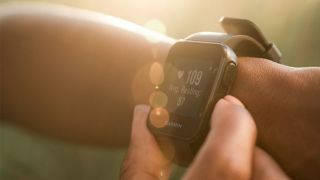 Whilst this is clearly of benefit, the wrist-based heart rate monitoring is not without its faults, particularly when it comes to tracking heart rate during interval sessions. When compared to the heart rate readings of a traditional chest-mounted monitor, the wrist-based version is a little slow to react to rapid rises and falls in heart rate, although it performs well on steadier runs. The Forerunner 35 is arguably a tad overpriced, but if you’re keen to sample Garmin’s Elevate technology without breaking the bank, you can’t go too far wrong with this sleek watch that offers smartwatch capabilities as well. Continuing the theme of wrist-based heart rate readings, the Garmin Forerunner 225 was actually Garmin’s first unit to feature this innovation – although, this watch uses a sensor made by Mio, rather than Garmin’s own Elevate technology, which came later. Garmin has made a concerted effort in recent years to make even its most advanced watches simple to use. This is evident in the 225’s interface, which is as intuitive and straightforward as the more basic devices above. The watch also features a sharp, color LCD display which really earns its keep when the color-coded heart rate zone training function is in use. While the 225 lacks some of the super-advanced features that we’ll see further down this list, it caters for all but the most stat-obsessed runners out there. The intervals tool, for instance, provides good workout customization, allowing you to perform sessions created on Garmin Connect, combining metrics like pace, time, distance, heart rate and intensity. The Forerunner 230 was part of Garmin’s triple launch towards the end of 2015, when the 230, 235 and 630 were all announced to the running world. The 230 is the cheapest and least advanced of the trio, by virtue of it not having a built-in heart rate monitor, but it does have smartwatch capabilities and a very respectable battery life. The 230 also includes some interesting post-run metrics, such as VO2 max calculation and Training Effect. The watch will give you a VO2 max value at the end of a run (if it has changed) and the Training Effect data can help you understand how much of an impact a given run has had on your body (this is massively oversimplifying a much more intelligent feature). For those runners who are partial to a bit of two-wheeled action, the 230 helpfully includes a cycling mode, and the unit can be paired with ANT+ speed and cadence sensors as well. The touchscreen Garmin Forerunner 620 is described by Garmin as an ‘Advanced running watch with Recovery Advisor’. Once Garmin’s flagship running watch, it has since been surpassed by the watches further down this list, but it still has enough going for it to warrant consideration. The 620 doesn’t have smartwatch capability, but it does have VO2 max estimates and, when paired with an HRM-Run monitor, it can satisfy even the nerdiest of runners by providing data for cadence, ground contact time and vertical oscillation. The Garmin Forerunner 235 is very similar to the 230, which it was launched alongside at the back end of 2015. The 235 builds on the 230, though, in that it features Garmin’s Elevate technology. As has been mentioned above, this wrist-based innovation is not without its pitfalls, but it does account for the difference in price between the 230 and 235. The 235 offers music controls and audio announcements (if you don’t mind bringing your phone along for the run) and you’re also able to pick up smart notifications for calls, messages and social media updates. This impressive list of functions, coupled with the stylish appearance of the 235, makes it a formidable package that is tough to beat - and it's constantly getting discounted at the moment. What's next? There are lots of rumors of a Garmin Forerunner 245 Music in the works so you may want to hold off buying the Forerunner 235 until that's released. The versatile Garmin Vivoactive range offers super-detailed activity tracking capabilities complete with powerful GPS and heart rate sensors that make it suitable for everyday runners who also like to track general activity. The third edition, the Vivoactive 3, includes the new Garmin Pay contactless payments platform (UK launch pending) and access to loads of apps (Uber, Accuweather, etc.) and watch faces via the Connect IQ store, not to mention plenty of smartwatch connectivity. There are 15 preloaded sport apps and the 5ATM water resistance makes it a perfect swimming companion. With a 13-hour GPS battery life, it also offers far greater longevity than the Forerunner series, and the stainless steel bezels make it one of the more attractive fitness-themed smartwatches out there. The third watch that was first introduced to the market in Garmin’s three-pronged 2015 launch is still one of the most exciting the company has produced. Commanding the biggest price tag of the three, it also boasts the most varied array of features, despite not having heart rate at the wrist. This advanced smartwatch lays claim to helping runners track just about every metric they can possibly imagine. As well as the VO2 max function discussed above, the Garmin Forerunner 630 will estimate your Lactate Threshold, stress levels and ‘Performance Condition’ (which gives an insight into how much energy your muscles have left while running), while advanced running dynamics such as ground contact time, balance, stride length and vertical ratio offer a whole new dimension of tracking and analysis. There really is plenty for the data nerds to get their teeth into with this one – plus, it looks better on your wrist than models from previous years. A really great running watch that will entice those that like using buttons over the touchscreen of the Forerunner 630, the 735XT is a great watch for those that want to push into the world of triathlons. It doesn't have the battery life of the Forerunner 630, but very similar stylings and we're loving the blue frost colouring that adorns one of the versions. It's also got a wrist-based heart rate monitor too, so you've got access to your pulse without a chest strap. It's skill is in the variety of activities it can track - with smart notifications built in, it's a quality watch for the triathlete. In an overdue move, the Garmin Forerunner 645 Music finally lets you add tunes to your running with its latest model. The first running watch out of the Gamin stable in 2018 has room for 500 songs, either through offline playlist transfer or downloads, meaning you can leave the phone at home. The main draw here is the stylish design, where the stainless steel bezel make this the most attractive (and lightweight) Garmin to strap to your wrist. It's also a very capable multi-sport model too, with only the lack of open-water swimming and triathlon mode missing. However, we're not fans of this watch, and would go as far to say it's one of the weakest on the list, thanks to there not being an option to sync music from a streaming source. It was supposed to allow you to do this from Deezer or iHeartRadio but that's not materialized yet. The battery life is also a bit short - it's fine when running, but as a connected device, it could be a lot better. The 935, which isn't that much more expensive, does nearly everything the 645 can (minus music playback) and wipes the floor with it in terms of battery performance. Looking for a sleek watch that can, well, track pretty much anything? The Garmin Forerunner 935 is one of the best out there in terms of not only the sports it can track, but how it tracks them. There's a barometric altimeter, compass, gyroscope, accelerometer and thermometer in there - meaning you'll get all the information you can from your activity. Like most of the watches here, you can upload easily to Strava and that'll include the heart rate data even without a strap, thanks to that being built into the watch with Garmin's Elevate tech. In short, this is one of our favorite fitness watches... a great buy if you can afford the extra outlay for the battery life if nothing else. The Fenix 5 is almost identical to the Forerunner 935, but comes in a larger, more robust frame with greater colors and the same multisport functionality. It can track everything with all the same sensors, has smart notifications and the same GPS accuracy - in short, this is the watch for you if you want to be equally as adept at climbing mountains as looking great at work. Plus there's the Garmin Fenix 5S and Fenix 5X that come with slightly better features than you get on the basic Fenix 5 product. Then there's the Garmin Fenix 5 Plus. This comes with storage so you can listen to music, Garmin Pay and fully routable color topo maps that make it a solid upgrade of the original Fenix 5. The price is still high, but if you're looking for a running watch at the top of its game; this is probably it. The battery life isn't as good as we'd hoped for, but it's solid enough to last most of your adventures. There's also the Garmin Fenix 5S Plus and Garmin Fenix 5X Plus to choose from too, with the latter of the two devices being the most feature rich Garmin watch you can buy right now. What's next? Rumors of a Garmin Fenix 6 series have been building, and we may see the company introduce it in the future.